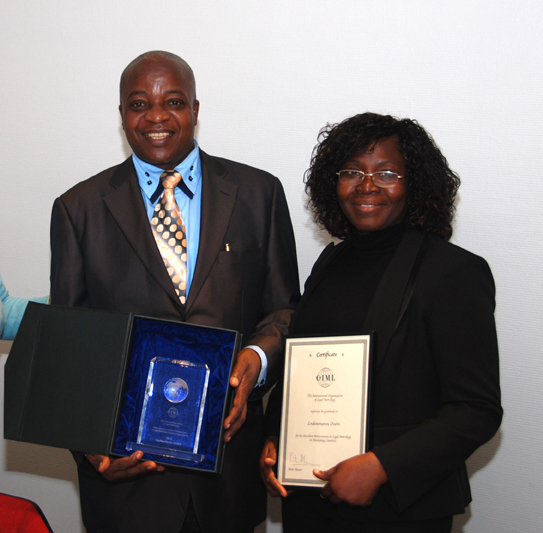 At the 47th CIML Meeting in Bucharest, Romania, the fourth OIML Award for Excellent Achievements in Legal Metrology in Developing Countries was awarded to Mr Loukoumanou Osséni, General Director of the Agence Béninoise de Métrologie et de Contrôle de la Qualité (Beninese Agency for Metrology and Quality Management) in Bénin. Ian Dunmill, BIML Assistant Director, detailed some of the achievements which had led to Mr. Osséni’s nomination for this award. He had been responsible for the development of a three year training schedule for some Beninese engineers in France, and had conceived and developed five sketches for awareness raising of metrology in his country. These sketches were presented to the public on suitable occasions to inform them of the value of legal metrology. Mr. Osséni had also developed a documentary on metrology activities which had been for television programs, as well as a number of other interactive television activities on metrology. It was due to his initiative that there was a website for his Agency concerning all the activities. There was also a “Metrology Fortnight” once a year in Benin, where there were again awareness raising activities for the public, for people in industry, for people in small businesses and amongst political decision makers. Mr. Osséni had ensured that his laboratory had received accreditation for mass, which made it the only public calibration institute in that French speaking part of West Africa. He had also developed training within their agency for people from surrounding countries. As an expert in legal metrology, he had even been sent by his government to Haiti in 2005, following the problems they had had there, as a consultant in developing legal metrology in that country. In conclusion, Mr. Dunmill said, it could be seen that Mr. Osséni had had a number of personal activities to improve the awareness of metrology in his own country in quite innovative ways. Although some of these could be seen to be part of his job as the head of his national metrology body, he had used a lot of his own personal enthusiasm and drive to get this work in place to raise awareness. The fact that he had also used World Metrology Day as a catalyst for some of his local events linked the activities in his small country into those at an international level. It was therefore felt that his work had made many excellent contributions to legal metrology, which benefited not only his own country but others in the West African region as well. Mr Osséni was later presented with his award at the BIML.